2003 Upper Deck Prospects Premiere Jake Fox certified autograph, 2004 Donruss Elite Extra Edition Thomas Diamond and 2004 Bowman Chris Lubanski - I was itching to do something and I traded three uncertified autograph cards I gotten signed in-person myself [Mark Langston, Kelvim Escobar and Garry Templeton] for these. It maybe harder to find certified autograph XRC or rookie cards and picking them up is tricky, if you just want to do so and not get into this prospecting business - unfortunately, I think Fox was passed up by Geovany Soto on the Chicago Cubs' organizational chart at catcher, Diamond missed the 2007 season because of Tommy John surgery and Lubanski's first cards came out the year before. Orlando Cabrera for Jon Garland is an interesting move - Cabrera is supposedly an aging shortstop who is coming off a career year - he was also the best athlete on the team [sorry: Chone Figgins] and the quarterback of the infield. I think the Angels will survive because they have millions of owner Arte Moreno's money to spend, but not having a capabale backup catcher [Jose Molina] may have hurt them this past postseason and now they've traded away a guy who is a wizard on defense and a clubhouse leader. I think Erick Aybar is going to be given the first opportunity see what he can do at shortstop - he was the Angels'top prospect at the position for the last several years, though he hasn't gotten an extended opportunity to prove himself as a big league regular. Maicer Izturis can also play shortstop and may actually start, though his ability to stay healthy the entire season is a question mark. Izturis maybe more of a supersub, filling in on an everyday basis. Garland, who may or may not be part of another, significant deal is what he is and that maybe just good enough - the So.Cal native keeps his era around mid 4.00 level and while it isn't particular impressive, it looks like he keeps his team in games. He has recorded double digit wins in the past six seasons and is fairly durable, throwing 200 innings or more in the past four years. As for the rumored trade talks for guys like Miguel Cabrera and also Miguel Tejada - I'm not holding my breath, though obviously it would be great to have either one [or both] on the left side of the infield for the Angels. Alex Rodriguez - New York Yankees - I think I've been waiting a while, expecting to make this post already. It was A-Rod's award to lose and he obviously deserved it, along with a new $275 million 'extension' he'd jockeyed for ever since he opted out of his contract just before the World Series ended. He might just be [he is] the best player people have seen in decades - Barry Bonds has 762 home runs, but if A-Rod is just several 'big' seasons away from that number and it looks like he is going to do it within the next five or six years, not at an age, where you need HGH or other performance enhancing drugs. For whatever reason, I think A-Rod is a guy who has other interests to pursue and will not be playing baseball long enough to reach Barry and beyond. On the other hand, his new contract clearly defines, Rodriguez will be expected to chase the all-time home run record in the Major Leagues. I remember paying at least $18 for the card - it maybe worth a third of that, but I bought it when Upper Deck released its 2001 Upper Deck SP Game Bat Milestone Edition Baseball product. A-Rod was one of the established superstar players of the day [still is] and I thought I just had to get a bat card of his. Now bat and jersey cards are a dime a dozen [even for superstars] and they aren't special anymore, unless you really just want one for your personal collection. 2007 Upper Deck Masterpieces [$2.99] retail pack - was at a popular retail store and was tempted at picking up some packs at their trading card section. I had three packs 2007 Bowman Heritage [$2.99 each] and two 2007 Fleer Ultra fat packs [$4.99 each] in hand, along with a pack of 2007 Upper Deck Masterpieces [$2.99]. I ended up only picking up the Masterpieces pack - trying to exercise restraint when you want to bust some packs is hard, but there was no need to get crazy on retail. I considered the packs and I was probably only to get a bunch of base cards. If I can get base cards for a nickel, it isn't fun when you are paying $3 or $5 a pack retail. The Masterpieces are nice looking cards - the 'matte' board stock the base cards are printed on makes them feel more than just another set, especially when you are flipping through the cards. I got Hideki [the Average Asian] Matsui, Babe Ruth [pitching as a member of the Boston Red Sox], Andrew Miller [what a concept - both a MLBPA rookie logo card and an actual rookie card, according to pre-2006 definitions of a what qualifies as a rookie card] and a 1969 New York Mets World Series championship card, which I'm sure some Mets' fan will find appealing. Card shop buys - I'm from 'Los Angeles' and my friend and I went to a card shop down South to San Diego to visit a card shop after attending a public appearance/signing with this guy pictured below. 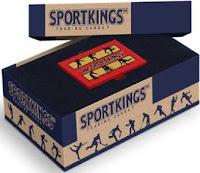 We'd stopped by CJ's Sports Cards and then one other one [Clairemont Sports Cards]. I didn't do anything for the first 30 minutes - kind of hesitant to ask about stuff. The store is less 'flashy' compared to CJ's, where there is a lot of things to catch your eye such as autographed memorabilia. The card displays [baseball section] featured cards of local players, some better premium cards, vintage cards I should be paying attention to and others. I was sort of tempted checking out the packs, but not quite [2007 Bowman Heritage was $4 a pack, while 2007 Upper Deck SP Rookie Edition was $6] - for whatever reason, 2007 Upper Deck SP Rookie Edition is my 2006 Tristar Prospects. It is a fairly common product, but I just can't find one pack of it to pick-up. We were going to leave, but I finally got the courage to ask about the boxes [years and years of various commons] on the shelves - I asked how much the cards were and the man at the counter said they were 12 for dollar. I just then went nuts for the next 30 minutes - I realized I had access to all these common cards and possibly, I might just be able to pick up some cards from brands like the 2005 Turkey Red [the autograph set I forgot I was doing]. I got stuck on pulling out a bunch of those, even though I realized Allen and Ginter was nicer to get signed. I wouldn't spend $17 on scrap cards and I'd probably overspent on principle, but who knows if I'll see a card again in the immediate future - however, at this point of the collect game, you you don't need to look need to have a card in-hand worth so much money, just cards to look through and make you smile. It kind of gets tedious when you want to look for set fillers and unique common cards, but the venues are seemingly limited. You can't always go somewhere and flip through boxes of cards to dig for all these cards - the thing is you aren't working from a checklist, but you are hoping there are diamonds in the rough, even if you are looking for a unique card still worth five cents. Maybe one day, I'll pull a Forrest Gump and wonder why I was running from coast to coast - for now, I'm just enjoying the journey. I just kept stumbling on cards I couldn't put back featuring players wearing retro uniforms, making awesome catches, making awesome plays, et al. I don't know if I found one 'bonus baby,' but I got a lot of everything else for my various collecting topics collections. For particular brands, I'm collecting them because I want to get them autograph in-person or through the mail. 2 2001 Fleer Tradition cards - Placido Polanco and B.J. Surhoff; only two missing cards I can remember off the top of my head, though there is more. Original cards were mailed off and are missing in action. 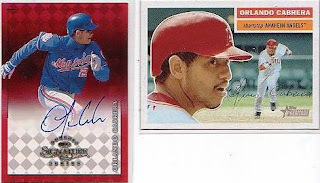 89 2005 Topps Turkey Red cards - I pulled two I had doubles of in Mike Lieberthal and Chris Burke. compiled for in-person autograph endeavors, autographed already or scattered in general. 9 2006 Turkey Red cards - never really got into this product, though I'll see what I can find and pick up. 13 2006 Allen and Ginter cards - I don't know how many I have unsigned. 35 2007 Allen and Ginter cards - Noah Lowry was the double I picked up and I now have 56/350, not counting short prints, loose cards in 'team sets' I've compiled for in-person autograph endeavors, autographed already or scattered in general. For other cards, I'm collecting them because they are cute - there is no way to describe them. The draw isn't some great endeavor to find a rare variation or another card to get autographed. I'm looking for base cards that may get one second glance and a 'hmmm, that is interesting' from everyone else, but not me. 26 'awesome action or personality shot' cards - from this stack, it seemed most came from 2005 Upper Deck and 2001 Fleer Ultra, with a few card from 2001 Topps Fusion. I was surprised at finding so many cards from the Fleer Ultra set and they really put something into the image selection of their 2001 set. 1984 Fleer - personality shots [Glenn Hubbard and his boa constrictor]. 1989 Upper Deck - personality and awesome action shots. Other products [such 1990 Leaf, 1991 Stadium Club] followed - giving collectors more options as far as attractive looking base cards, something that would never come out of a $0.50 Topps pack. 4 'awesome outfield action' shots - specifically guys in the outfield making plays. 4' retro uniform' shots - guys pictured in retro uniforms. 1 'pitcher doing hitter hitter things' shot - this one was a 2004 Topps card of Jason Marquis leading off first base, looking at the pitcher. 9 'young stars' cards - just different cards catching my eye, featuring Ryan Zimmerman, Prince Fielder, Grady Sizemore, Felix hernandez, Matt Caine, Brian McCann, Nick Markakis, John Maine and Jeff Francoeur. 1 Jim Edmonds card - for whatever reason, he is sentimental favorite from his days as a California/Anaheim Angel. 10 filler cards - just random cards to possibly get signed in-person or through th e mail. 1 2007 Goudey Brian Roberts - the images looks vaguely like Manny Ramirez; I'm not saying the image is of Manny being Manny, but you wonder how the people at Upper Deck morphed Roberts' image into the card. 1 2004 Topps David Bell - Jimmy Rollins is peaking in the background; Rollins has been a star for the last four or five years, while, Bell is somewhere in oblivion after not playing in 2007. 1991 Topps Stadium Club [$0.75 each or 10 for $5] packs - I busted eight of the 10 packs I picked up from a card shop's unopened clearance bin and the 'superstars' I pulled were Frank Thomas, Wade Boggs, Don Mattingly and Greg Maddux [x2]. I wasn't going to pull any single cards out of this product worth mentioning [anymore]. However, when every 'modern day' pack at the shop I visited was at least $5 or $6 each, I was looking for loose packs maybe on 'we just want want to get rid of this crap' discount. Considering this was one the hottest products of its time when it first came out, I had to 'fish' for some of these packs - especially when products like these, when they first came out, was something really mystical to me. The serious collectors had 1989 Upper Deck, 1990 Leaf and 1991 Stadium Club, and I had 1991 Donruss, 1991 Fleer and 1991 Topps. The 1991 Stadium Club boasted photo quality images and in its prime, was not regarded the same as 1988 Donruss - I tore through the packs knowing its pretty much a dead product, though still feeling like I was making up for something I never had. I also pulled random California Angels [Chuck Finley, Brian Harvey, Luis Polonia, Lee Stevens, Mark Langston, Mike Fetters among a few others] and minor stars like Larry Walker, Moises Alou, Gary Sheffield, Craig Biggio, Omar Vizquel, Eric Davis, Paul O'Neill, etc - its funny, but perspective changes over time and I'm mentioning those players like their cards were worth pulling back then [or now], when they were all commons. Now, you can take a look at someone's statistics on Baseballreference.com and realize how Biggio is in the 3,000 hit club, how Sheffield and Alou are still playing and players like Walker, Vizquel, Davis and O'Neill were considered 'stars,' if not all-star performers. 2007 Upper Deck SPX Winning Material Eric Chavez patch serial #'d 54/99 [$3.88 plus $2.50 s/h on Ebay] - I like patch cards, but Eric Chavez has to be one of the most disappointing players this decade. Seriously, he has all the talent in the world as an 'all-world' defender and he's kind of pretty good, but inconsistent. I think the Angels could use him, though the past two years, he hasn't quite come around with the bat, because he's been banged up. If he only put up four or five consecutive years of all-star offensive seasons, he'd be a future Hall of Famer.